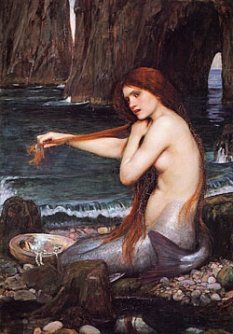 The roots of mermaid mythology are more varied than one would expect. In modern myth we tend to see mermaids in a singular way - kind and benevolent to humans who keep to their own kind in the deep waters of the ocean. Not all stories go this way, though, and in most cases the most ancient tales of mermaid mythology follow quite a different view. The earliest known mermaid legends come from Syria around 1000 B.C. where the Syrian goddess Atargatis dove into a lake to take the form of a fish, but the powers there would not allow her give up her great beauty, so only her bottom half became a fish and she kept her top half in human form. As myths tend to do, the story changed over time and Atargatis became mixed with Syrian goddess Ashtarte, who is generally considered the counterpart to Greek mythology's Aphrodite. Though Aphrodite is rarely portrayed in mermaid form, this evolution of mermaid mythology is what led to Aphrodite's role in the mythology of Pisces, which clearly has roots in Syrian mythology. Later tales in the mythology of mermaids stem from Homer's epic "The Odyssey", where some mythologists believe the Sirens to have been in mermaid form. This was an extremely popular version of the mermaid throughout history. Many popular tales including legends from the British Isles and the famous Arabian Nights tales identify mermaids in exactly this fashion. In these myths, mermaids would sing to men on ships or shores nearby, practically hypnotizing them with their beauty and song. Those affected would rush out to sea only to be either drowned, eaten, or otherwise sent to their doom. The evil-intentioned mermaid is not the only way these creatures were seen as dangerous. Some believed that even well-intentioned mermaids would cause great danger to men who believed they saw a woman drowning and would dive into the waters to save them. Other tales suggest that mermaids either forgot or didn't understand that humans could not breathe underwater, and they would pull them down into the depths of the sea, accidentally drowning them in the process. In the modern mythology of mermaids, however, this is rarely the case. Today these beings are more likely to be seen as innocent and sweet, if not helpful in many cases to human kind. Much of the modern interpretation of mermaids can be credited to the most famous tale in all of mermaid mythology - Hans Christian Andersen's "The Little Mermaid" and the subsequent Disney movie of the same name. This famous tale was likely the introduction of the mermaid to many children and adults alike, which makes it no surprise that people tend to stick with that version of this widely recognized creature. Not that Mr. Andersen was alone in this interpretation. Many cultures believed that these beings were immortal and had powers ranging from the ability to cure disease to granting wishes to being able to share their immortality. Return from Mermaid Mythology to the List of Mythical Creatures.